A chair has one job. To keep you off the ground. Every year, thousands of Americans are hurt in serious defective chair accidents and require emergency room services to treat their medical injuries. A person may fall off a chair due to it collapsing, fingers may be sliced or even severed by a chair with jagged edges, or hands may be crushed and broken between seats and their bases. These types of defective chair accident injuries can happen anywhere - in a private home, a commercial business, or on public property. If you or someone you know has been hurt in a defective chair accident in Henderson or any other part of Nevada, contact the experienced personal injury attorneys at Parry & Pfau today to learn about your options under the law. The injuries suffered by the victim caused real damages (medical bills, lost wages, pain and suffering). Notably, if the chair was defective due to poor design, manufacture, or marketing, then product liability law governs the case. If an injured party can successfully prove that the chair was defective, then there is strict liability for the defendant. There are several ways in which a knowledgeable Nevada attorney can prove your chair injury claim. This includes presenting as much hard evidence as there is available such as eye witness statements, photographs of the defective chair as well as other chairs for comparison and injuries suffered, and video footage of statements made by workers at the business. It is important to understand that simply falling off of a chair or suffering a minor scratch due to a screw that was protruding is not enough to win your personal injury case. In short, a real injury must have occurred resulting in medical bills. Lack of medical proof makes it difficult to win a personal injury claim. Keeping a good record of all receipts, hospital visits, doctors visits, medication needed, and other follow-up treatment to help your recovery is vital to your case. 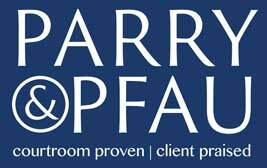 If you or someone you know has been hurt in a defective chair accident in Henderson, Nevada you should contact the skilled personal injury attorneys at Parry & Pfau. These experienced lawyers have protected the rights of the injured across Nevada for years. Click here today to schedule your initial case evaluation.